I love stirfries. Literally you just dump whatever you want into the wok and you quickly stirfry it. Add some toasted cashews, and it'll look all fancy schmancy. And of course some colourful veggies. But seriously, just find whatever leftover veggies and throw it into the wok with some sauce and you're good to go. Combine soy sauce, sugar, salt, sesame oil, garlic chili sauce, cornstarch, garlic, and ginger in a small bowl. Mix well. Add chicken and toss until well coated. Transfer into a Ziploc bag and marinate 2 hours or overnight in the fridge. Heat oil in a wok on medium high heat. Brown chicken. When all browned, toss in remaining ingredients, except cashews and green onions. 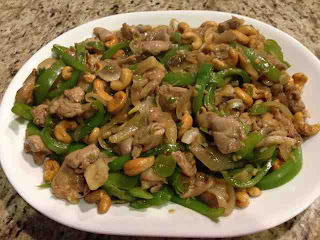 Mix well and stirfry until chicken is cooked through and veggies are tender crisp. If the sauce starts sticking, just add a little water and scrape up the brown buts. Turn off heat and mix in green onions and cashews. Serve with a side of rice.